To stay first on the minds of Texas educators and administrators, corporate partnerships are great opportunities to help achieve a company’s goals. Call at 1-800-717-2723, ext. 10 or e-mail to discuss your organization’s goals and budgets. Texas Association of Supervision and Curriculum Development (Texas ASCD) looks to partner with corporations who realize its vision and wish to align themselves with an organization committed to meeting the needs of the educators and, ultimately, the children of Texas. As a concerned corporate partner, you play a vital role in changing and improving the public education system. 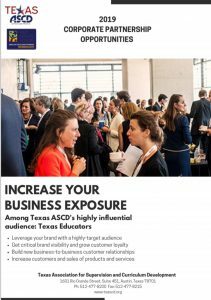 With this commitment, partners will receive a wealth of corporate partnership benefits, gain greater image visibility, reach potential new customers, facilitate the work of Texas ASCD and, most importantly, make a difference in the lives of the Texas children. Past partnerships have included annual and regional conference underwriting. Other types of partnerships include underwriting of receptions, breakfasts, luncheons, speakers, and educator scholarships for professional development. Copyright © 2017 Texas ASCD, All Rights Reserved.